Fig. 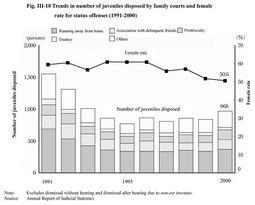 III-10 shows the trends in the number of juveniles subjected to final disposal by family courts by type of status offenses and female rate (the proportion of female juveniles to the total status offenders)in the past 10 years (see Appendix III-7 ). The number of status offenders disposed fell below 1,000 persons since 1994, and came to 968 persons (an increase of 13.1% from the previous year) in 2000. Major types of status offenses include running away from home, association with delinquent friends, promiscuity, truancy, etc. Of these offenses, despite a downward trend in the actual number, running away from home has almost consistently accounted for the largest share in status offense cases, amounting to 38.1% in 2000. The female rate remained at the high rate of around 60%. However, it has fallen below 60% since 1997. By age group, junior juveniles had the largest share in status offense cases in 2000 for both males and females, namely 52.5% for males and 54.3% for females. They were followed by intermediate juveniles (25.1% for males and 36.7% for females), and senior juveniles (11.3% and 5.5%, respectively).